Pencil on two pieces of paper joined. pencil on paper H 14" X 17"
Larry Stanton18"H X 24" Charcoal on PaperNot signed or dated. Larry Stanton Pen on Paper 14"H X 11"
Signed "L. Stanton May 30, '69." Larry Stanton Pen on Paper 18"H X 15"
Larry Stanton Crayon on Paper 9" X 11"
Larry Stanton Crayon on Paper 18" H X 24"
LARRY STANTON CRAYON ON PAPER 14" H X !!" NOT SIGNED, DATED, OR NAMED. LARRY STANTON CRAYON ON PAPER 18" X 16" SIGNED "STANTON" NO NAME OR DATE. LARRY STANTON CRAYON ON PAPER 17" H X 14" NOT SIGNED OR DATED. THERE IS A DRAWING ON THE BACK OF THE WORK. SEE NEXT IMAGE WHICH SAYS "TOM" THIS IS ON THE BACK OF THE BOY'S HEAD DRAWING. On back of Boys Head X,. $450 Actual drawing is not fuzzy as it looks from the big image. 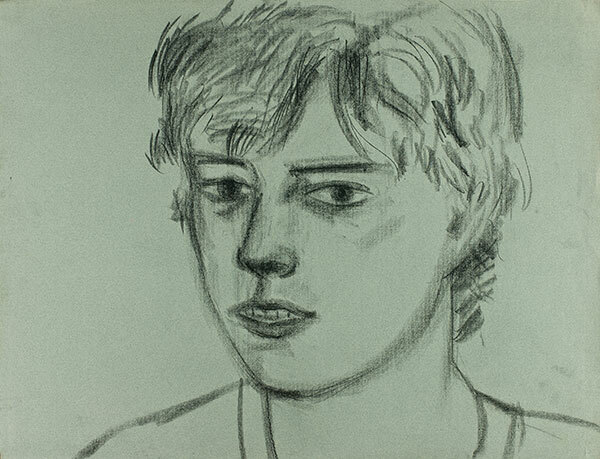 Crayon on Paper 17” H X 14” Not signed, titled, circa 1982. Not noted on canvas but designated by Personal Rep.
NOT TITLED OR SIGNED BUT AUTHENTICATED BY PERSONAL REP.